Continuing his series of guest blog posts on talent management, Steve Curtis, EMEA Channel Director at NetDimensions talks about competencies and assessments. Many of us think of assessments as things that are used in learning to assess a user’s understanding of a set of education. Assessments in the Talent Management world are a different beast altogether, and the purpose of this week’s blog is to review assessments in the world of Talent Management. Last week I talked a bit about competencies – leadership and technical. The critical talent in a business can be the people who are identified as the future potential leaders of that business, but can also be the deep techies, who we can all love to hate, but who at the same time are sometimes the more critical talent of the business. People with the ability to lead effectively are in demand, but some technical abilities can be truly unique and therefore quite often it is the people with technical competencies that can be the critical talent for the business. At some point each year (and for some businesses and roles at multiple points during the year), the business will want to have a person’s competencies assessed formally. Assessments of this kind normally are not something that you can do via a test – it is not an assessment that we, with our learning backgrounds think of – it is normally more of a subjective measure of the abilities of an individual, and this is where there can be a challenge for the business and for HR. Let’s give a real example of this in action. Fred is a call centre manager, and at a personal level his manager doesn’t really like him much. However he is good at the job, is liked by the people who report into him, and has a good reputation with the customers. In a normal organisation with a pyramid organisational structure, and in a pressured business environment, it might only be his manager that will formally score him against his competencies, and this might cause an issue since his manager doesn’t really like him. More and more businesses and HR are therefore trying to move to a 360 degree assessment model, where Fred is assessed by his manager, by the people who report into him, and by other people, including maybe even the customers who work with him, and the people who work alongside him. This is called a 360 degree competency assessment, and there is software out there that will do this automatically. The benefit of this approach is that the ratings become more objective and less subjective if the business involves all the right people in the rating of his ability to do the job. Some software will allow the business to weight the scores, so that maybe the manager’s rating counts for 50% of the score, the subordinates total 30% etc…. There is always a negative to this and the gotcha here is that the more people you involve, the more time it takes, and the more admin it needs – paralysis by analysis again can easily rear its ugly head. 1. Should a rater be named on the assessment, or be anonymous? If someone rates you with a poor score would the business want the person being rated to know who it was that gave him that low score. The ability to set a rater as anonymous is sometimes asked for, but both ways can have positives and negatives – anonymous ratings with comments are often constructively more useful as the rater feels more able to be honestly constructive about the rating. However anonymous ratings may not give the person being rated the ability to ask the rater why a rating was given or how they could improve. So there is not a right answer here. 2. How many people should be involved? – the more the better, but too many and you get paralysis through analysis. 3. Should you have different setups for different jobs? 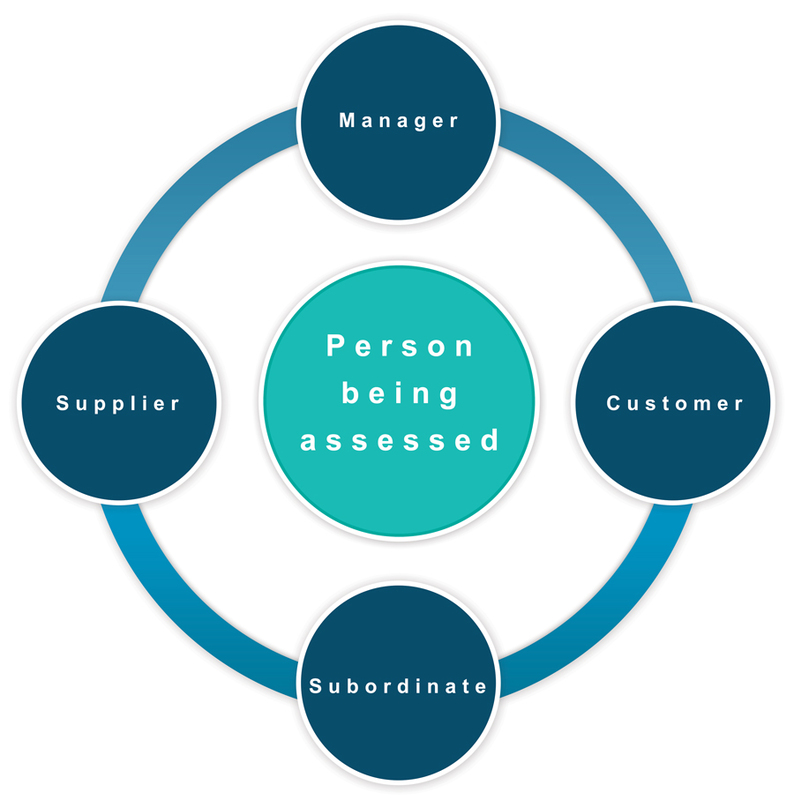 – for instance if you have a retail organisation with high turnover and you set the assessment so that everyone is assessed in a 360 degree way, is it right to have a shelf stacker rated in the same way as a senior manager – of course not – so you need to have a flexible approach where 360 degree assessments may only be used for areas of the business and people where it will benefit the organisation. 4. Do you want comments at all, or just ratings? – comments can help but again take longer to put into the system. 5. Should you even involve the extended enterprise? – customers and suppliers – should they be involved at all in rating your people? Their opinion will count for customer and supplier facing people, but do you want to expose them to your internal appraisal systems. 1. There is a movement away from subjectivity towards objectivity. 2. Some organisation wrap the competency assessment into the performance appraisal – but the 360 degree assessment can be done at any time of the year, and often businesses will isolate one from the other. 3. When linking competencies to learning the last thing most organisations want is to have the rating of a person move upwards automatically after the person involved has attended training related to a competency. Businesses are much more interested in seeing that the training has allowed the person to be more effective in that aspect of their job, and so while we often want to link competencies to training so that the business can allocate suitable training based on competency gaps, the business will want to have a period of time then after the training before the 360 assessment to see how the training has affected the competency of their workforce. Some systems allow the business to visualise the uplift in competencies and link this to delivered training and this is one of the “nirvanas” for the L&D department…. Enough for this week….next week I’ll move on to Performance Appraisals – a subject we should all know well.